This agreement is drawn with specific reference to Distribution of Computer software. The document suitably covers the business needs of an arrangement between a Software developer and seller/distributor. A distribution agreement is also regulated by Company law and our document complies with all of those regulations. The details have been provided in the explanatory notes that accompany the document. Kindly ensure to go through the notes before using the document. The agreement provides for conditional appointment of sub-distributors within the territory and imposes strict responsibilities on the distributor there for. The document is suitable for International transactions as well. Who will use this document? 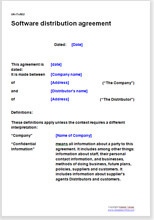 A Company arranging terms for a distribution arrangement of a computer software with a partnership, proprietorship firm or another Company in India for a defined territory. Activation code; 7 days’ serial key; 15 days money back guarantee. Appropriate legal provisions, warranties and exclusions. This document has been drawn by Rakesh Taneja, unconnected with Net Lawman. Rakesh Taneja will welcome your contact for further legal help. There may be a charge for Rakesh Taneja services.